Let Ridge Specialties treat your family to a buffet of gourmet breakfast and lunch items, decadent desserts, and more at our fifth annual Mother’s Day Brunch! The buffet will feature fresh local food, coffee, tea, and lemonade. Mimosas and Bloody Marys will be available for purchase. See this year’s menu details below! $25.95 for ages 9+, $14.95 for ages 3-8, ages 2 and under are free. $1.00 off each reservation if you register 14 days before the event! Advanced pre-paid registrations only by check or charge. Late reservations by chance – call for availability. Deadline to reserve is Friday, May 11th. To receive a full refund, a cancellation must be made in writing seven days prior to the event’s scheduled date. 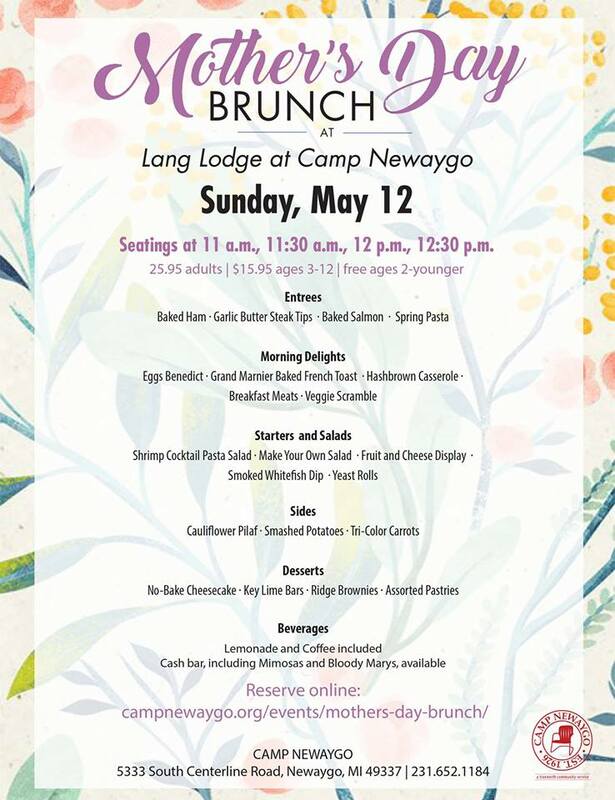 To request a cancellation, please email campbiz@campnewaygo.org.